I’ve been thinking a lot about Robin Hood lately, now that I’ve completed Villain, number three in my novel series The Chronicles of Robin Hood. The final book in the sequence will be out next summer. I have always enjoyed the tales of Robin Hood, and my novels Loxley, Wolfshead and Villain, have been decades in the making. It probably all started watching episodes of the Richard Greene series. Playing at Robin Hood was always the favourite game in our neighbourhood – in those happy days when children could make a longbow or wield a wooden sword without social services coming round to take you into care as a potential menace to society. If you want to read mine, the first three novels in the sequence are available in paperback and on Kindle. 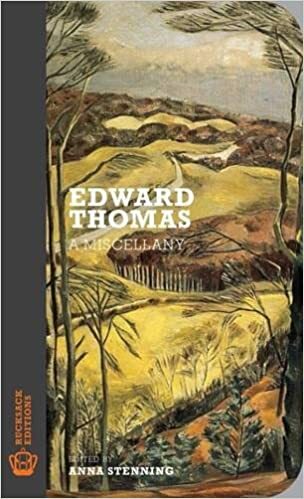 Edward Thomas – A Miscellany, selected by Anna Stenning, is a splendid new anthology of some of the prose and poetry of the well-known country writer who died tragically young – just over a century ago – at the Battle of Arras in the First World War. This handsome edition in the Rucksack Editions series by Galileo Publishers has been specially produced in a small but readable format with a tough chunky cover so that it might be packed in a knapsack and read on walks – though I’ve been dipping into it as a bedside book. Readers of past blogs will know that I’m a great enthusiast for the works of Edward Thomas. Not just because he was a country walker of some repute, but also because he captured the British countryside at such a crucial moment in time – when rural England was going through a fundamental change, when the population had become mostly urban, and there was a great cultural desire to records many aspects of the rural way of life. Lovers of Thomas’s work will find some old favourites in this volume, but a lot of material that isn’t quite so familiar – arranged in chapters with inviting titles, such as Footpaths and Roads, The Historic Landscape, The Journey, Inns and Sleep, Folk Traditions etc. If you don’t know Thomas’s work this is an admirable introduction, featuring a good spread of his poetry as well as some excellent excerpts of his prose work. Long-standing admirers, such as myself, enjoyed discovering old favourites and it was pleasing to be reminded of works that had slipped out of my memory. There’s a very good introduction by Dr Stenning, with a brief biography of Edward Thomas. Compiling an anthology isn’t as easy as you might imagine. I’m currently doing one myself, and have found that out. This really is a work to go out and buy and to be dipped into. Recommended, available from online sites and good bookshops. Rucksack Editions have companion editions to this featuring work by John Muir and Dorothy and William Wordsworth. This is to mark the fact that I’m now writing the third book in the William Quest series – it doesn’t have a title as yet. Unlike the first two books, which were set in London and Norfolk, this one is set in the winding streets and ginnels of York. And – as Quest has never been to York before – this puts him at a considerable disadvantage as he faces menacing new foes. I’ll let you know how the writing goes. Hopefully, the book will be finished by the end of the year. They are also both out in paperback as well. And free to borrow on Kindle Prime. For just this weekend, my book The Compleat Trespasser – Journeys Into Forbidden Britain is available for just 99 pence/cents as a Kindle read for your smartphone (with a free Kindle App) or to read on a Kindle device or laptop. It’s also out in paperback. “On a vagabonding tour through Britain’s most delightful countryside and forbidden tracts, Bainbridge charts the history of access and assesses the present state of the law. Villainous landowners feature; so do the likes of GHB Ward and CEM Joad, calling at rallies for access to mountain and moor. Gamekeepers, spring-guns and mass trespasses also get a look-in. Redolent of country air, with nature and archaeology dealt with in graphic style, the book evokes the age of campaigns before words like ‘stakeholder’ and ‘partnership’ were hatched out. ABOUT THE COMPLEAT TRESPASSER: In 1932, five ramblers in England were imprisoned for daring to walk in their own countryside. The Mass Trespass on to Kinder Scout, which led to their arrests, has since become an iconic symbol of the campaign for the freedom to roam in the British countryside. The Compleat Trespasser – Journeys Into The Heart Of Forbidden Britain, written by outdoors journalist and novelist John Bainbridge, looks at just why the British were – and still are – denied responsible access to much of their own land. This ground-breaking book examines how events through history led to the countryside being the preserve of the few rather than the many. It examines the landscapes to which access is still denied, from stretches of moorland and downland to many of our beautiful forests and woodlands. An inveterate trespasser, John Bainbridge gives an account of some of his own journeys into Britain’s forbidden lands, as he walks in the steps of poachers, literary figures and pioneer ramblers. The book concludes with a helpful chapter of “Notes for Prospective Trespassers”, giving a practical feel to this handbook on the art of trespass. At a time when government is putting our civil liberties at threat, destroying the beauties of our countryside, and your right to access it, this book is a most useful read. John Bainbridge has been a country walker for over fifty years. He was recently commended by the Ramblers Association for his many years of campaigning service to the rambling movement. He is the author of some thirty books and hundreds of magazine and newspaper articles, mostly about the countryside and outdoor life. John is also the author of the historical novels Loxley, Wolfshead and Villain, chronicling the adventures of Robin Hood – one of Britain’s most notorious trespassers – as well as the thriller Balmoral Kill and the William Quest mystery novels.